Officers of the Champaign County OSU Alumni Club include, from left, Treasurer Chris Harmison, President James Landenburg and Vice President Julie Balmer. 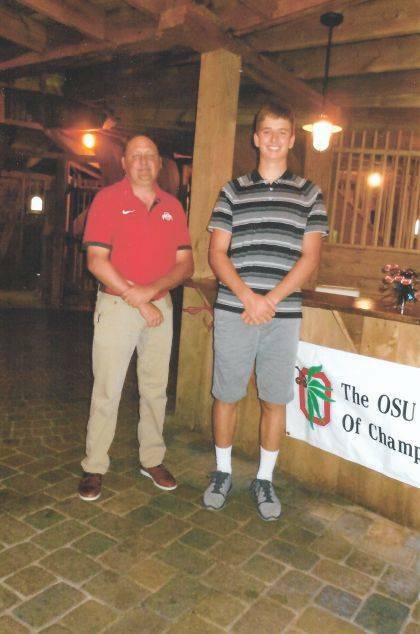 Matt Goddard, Champaign County OSU Scholarship recipient, right, was recognized by Club President James Landenburg at the College Kick-off meeting. 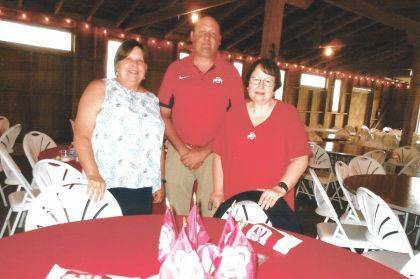 The Ohio State University Alumni Club of Champaign County held its annual pre-school meeting at the end of July. This meeting offers an opportunity to honor the Champaign County OSU Alumni Club Scholarship winner. This year’s scholarship recipient is Matt Goddard, who is a graduate of Graham High School. His family also was present for his recognition. Goddard spoke of his future plans, which include a major in agribusiness. The group re-elected the current officers to serve for the next year. Various future projects were discussed. Jan Ebert directed the Alma Mater, Carmen Ohio, to close the meeting. Hosts for the gathering were Jill and Todd Michael. News from The OSU Alumni Association was presented by Justin Fincher. Fincher is Chief Operating Officer of the OSU Alumni Association, and Senior Association Vice President. The Alumni Association sponsored the dinner. https://www.urbanacitizen.com/wp-content/uploads/sites/36/2018/08/web1_Web1.jpgOfficers of the Champaign County OSU Alumni Club include, from left, Treasurer Chris Harmison, President James Landenburg and Vice President Julie Balmer. https://www.urbanacitizen.com/wp-content/uploads/sites/36/2018/08/web1_Web2.jpgMatt Goddard, Champaign County OSU Scholarship recipient, right, was recognized by Club President James Landenburg at the College Kick-off meeting. Submitted by the Champaign County OSU Alumni Club.